Provide comfort for the family of Alejandro Cortes Ayala with a meaningful gesture of sympathy. 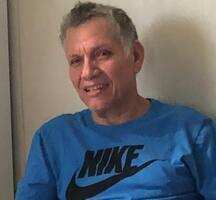 Crowley- Funeral Services will be held on Wednesday, January 9, 2019 at 11:00 Am for Alejandro Cortes Ayala, 61, in the Duhon Funeral Home-Crowley Chapel with Pere Rozas officiating. Visitation will begin on Tuesday, January 8, 2019 at 3:30 PM until 10:00 PM and will resume on Wednesday at 8:00 AM until 10:15 AM. Interment will follow the chapel service and will be Woodlawn Cemetery in Crowley, LA. Mr. Cortes Ayala passed away on Sunday, January 6, 2019. Mr. Cortes Ayala is survived by his wife, Silvia Perez Saucedo Cortes of Crowley, LA; father, Ramon Cortes of Mexico; children, Martin Cortes Perez and his wife, Yenitza Rodriguez of Houston, TX, Consuelo Guadalupe Cortes of Crowley, LA, Mayela Cortes and her companion, Mario Baltierrez of Crowley, LA and five grandchildren, Brayan, Elizabeth, Maritza, Alan, Aislinn. He was preceded in death by his mother, Consuelo Ayala. Pallbearers will be Martin Cortes Perez, Mario Baltierrez, Amador Cortes, Mark Cortes, Alfonso Cortes and Francisco Cortes. You may view the obituary, sign the guest registry and express condolences online to Mr. Cortes Ayala’s family at www.duhonfuneralhome.com. Duhon Funeral Home-Crowley, (337)783-1395, 1529 Crowley-Rayne Hwy., Crowley, LA 70526 is in charge of all of the arrangements. We encourage you to share your most beloved memories of Alejandro here, so that the family and other loved ones can always see it. You can upload cherished photographs, or share your favorite stories, and can even comment on those shared by others.